Win a double pass to Can You Ever Forgive Me? After decades spent composing profiles of successful women such as Katharine Hepburn and Tallulah Bankhead, Lee Israel finds herself out of step with the emergent trash-talk trend in biography. With no other skills to fall back on, Lee discovers a fresh method of capitalising on the public's fascination with fame: forging and selling letters of dead writers and celebrities. CAN YOU EVER FORGIVE ME? is a brilliant tale of deception that speaks volumes about our obsessions with celebrity, authenticity and the cost of aspiring to both. Rating: M Offensive language, sexual references & drug use. 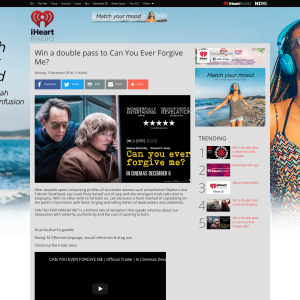 Win a double movie pass to Can You Ever Forgive Me? 1. 1 x double pass to Can You Ever Forgive Me? 4. This competition closes on the 9 December 11.59pm. Winner to be notified via phone.